We are increasingly specifying Lithium batteries as part of our power systems, the advantages of this technology are numerous – here we hope to explain the key elements and benefits. There are a few different types of lithium batteries currently available and each type comes with their own benefits. Lithium cobalt oxide (LiCoO2) batteries - which offers a higher energy density than other types of lithium batteries but present safety risks, especially when damaged. The main type of Lithium batteries currently used in marine, off grid and vehicle applications are Lithium iron phosphate (LiFePO4 batteries) as these are the safest and offer the longest life compared to other lithium batteries. 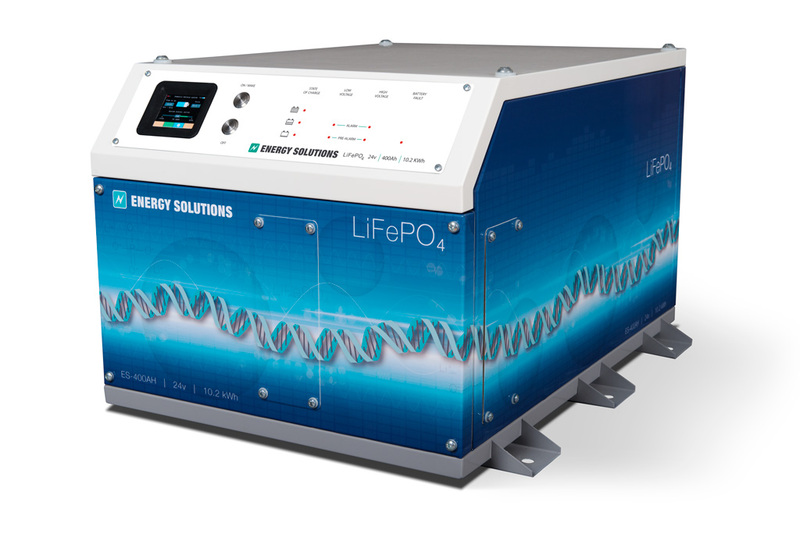 LiFePO4 batteries (LFP) are made up of several different cells connected in series, most LFP cells are 3.2 volts, one 12.8V LiFePO4 battery consists of 4 cells where a 25.6V battery consists of 8 cells connected in series. Cells may also be placed in parallel within a battery to increase capacity. Why choose Lithium Iron Phosphate batteries? When cycling lead acid batteries sulphate crystals are formed. During long periods of partial state of charge permanent sulfation sets in, reducing the capacity and the life cycle of the battery. LFP batteries offer a great alternative to lead acid batteries when the system batteries are expected to sit in a partial discharge state such as on board a yacht or mobile home during the winter months. LFP batteries have a better charge efficiency than lead acid, a lead acid battery will have a round trip efficiency of 80% or less (this is 100% SOC to 50% and back to 100%). Where a LFP battery has a 92% (or higher) efficiency, this makes lithium ion batteries great for off grid solar and wind systems where you want to capture and use as much of the renewable energy as you can. Lithium ion batteries have a much higher energy density compared to lead acid, this gives up to 70% saving on space and weight to comparable lead acid batteries. This is great for vehicle and marine application where space and weight is an issue. Victron Lithium batteries and our own Energy Solutions LFP batteries have a cyclic life of 2500 cycles at 80% DoD (depth of discharge), 3000 cycles at 70% DoD and 5000 at 50% DoD. Compare this to the cyclic life of an average gel battery at 1500 cycles at 50% DoD and your lithium batteries are going to last a lot longer. LFP batteries have a high initial cost compared to lead acid batteries, but as most systems will need to run for several years the initial investment will be paid off by the longer cyclic life and high efficiency. Lead acid batteries will not last as long and would need to be replaced much earlier. Every lithium ion battery system requires a BMS to manage the batteries, this monitors the voltage and temperature of the cells. As the cell voltage must stay within a typical range of between 4.2 volt and 2.5 volts it is important to monitor each cell to avoid cell failure. There is no way to recover a lithium iron cell, the BMS system manages this to ensure all of the cells are balanced and stay within the voltage required. Victrons BMS system has a range of cyrix combiners designed for use with the VE.Bus BMS. These are used to disconnect the load and charge off the batteries for protection from over voltage, under and over temperature. A battery protect can also be used to disconnect the DC loads from the battery instead of a Lithium load cyrix. The Energy Solutions battery has all of these components internally. Because the cells on LFP batteries do not auto balance at the end of a charge cycle some cells will be more charged than others. In lead acid batteries a small current is still drawn even when charged and this helps to balance all cells. Cell balancing is required in LFP batteries so the BMS system will use one of two method to balance the cells - either passive or active balancing. Passive cell balancing is when the fullest cells are have energy taken from them by the BMS (usually in the form of heat). This allows cells at a lower state of charge to catch up. This type of balancing is the simplest and most cost effective. These systems tend to only balance when a battery is being charged so the energy burnt off is from the charge source – not stored energy. Active cell balancing is when energy is transferred from one cell to another, this does not waste so much energy through heat, so maintains higher efficiency. Victrons’ LFP batteries have integrated cell balancing and monitoring. They still need to be connected to the Victron lithium BMS system. Within the system the cell balancing/ monitoring cables are daisy-chained together so you can connect up to ten batteries in parallel.